Kamakura: Realism and Spirituality in the Sculpture of Japan at Asia Society Museum, is a small exhibition presenting big changes in the art of Japan. On display are powerful works in every sense of the word. These are works commissioned, executed and embellished to bring benefits to the patron, the worshipper and the artist alike. The dynamic realism of these stellar works goes hand-in-hand with their role as miracle-working icons. Statues were designed to form a karmic bond with the worshipper, bring merit and benefits to the living, ease the suffering of those in hell and free the faithful from the cycle of reincarnation. 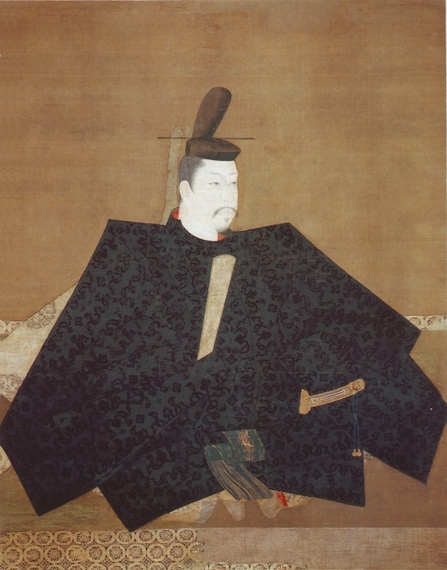 The Kamakura era (1185-1333) saw the establishment of military rule by a shōgun. The first shōgun, Minamoto no Yoritomo, established headquarters (bakufu) at Kamakura, on the rugged eastern seaboard of Japan. Imperial patronage, based in the old capital of Kyoto, was joined by powerful warriors called samurai. During the Kamakura, Buddhism expanded to further include popular movements that stressed pure and simple faith over complicated rites and doctrines. Grateful for their victories, some of the first acts by Kamakura warlords were to replace the burned or damaged Buddhist sculptures destroyed during the plague, famine and civil war of the 1180s. 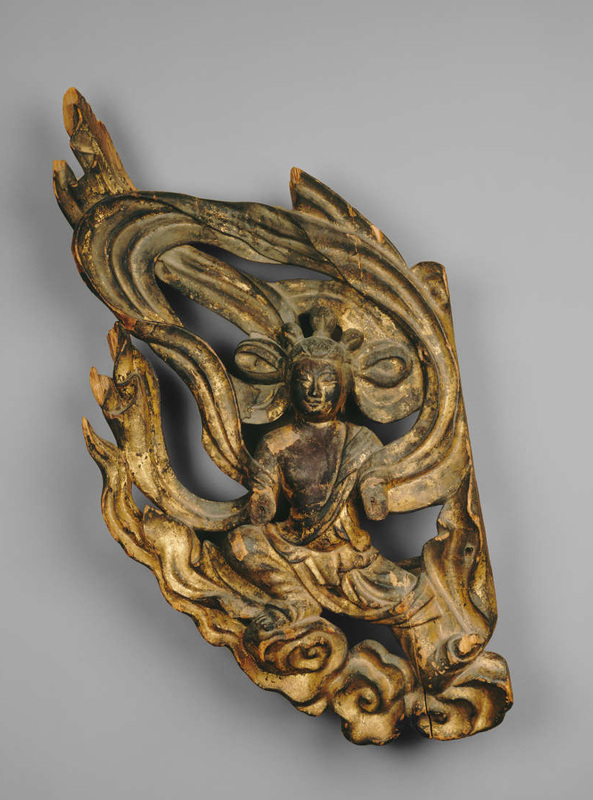 Like a rainbow after the storm, the flowering of Buddhist art during the Kamakura period reflects new devotion, new forms and new modes of production that result in dynamic and naturalistic sculpture designed to actively engage with the faithful. 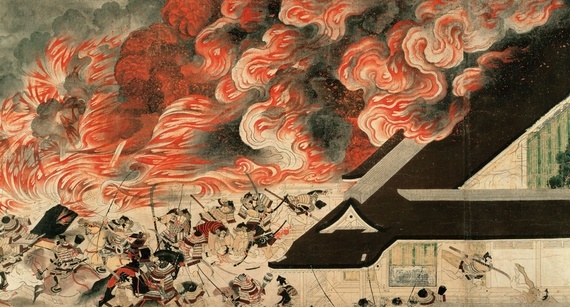 The concept of lord and warrior of the Kamakura period found a parallel in art production with the formation of workshops composed of master artists and apprentices. The members of such workshops were often of the same blood line. Masters and apprentices worked together on commissions, and masters signed their works, allowing us to trace their individual development. 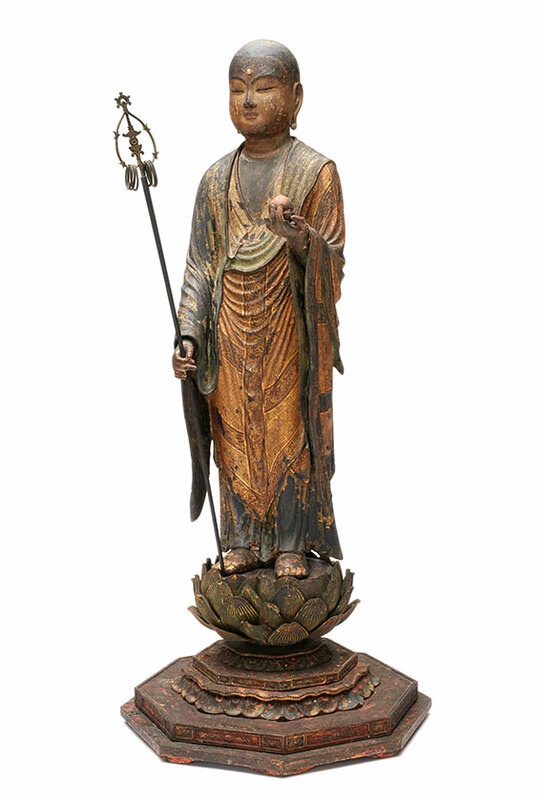 A Standing Jizō Bosatsu by the sculptor Zen'en (1197-1258) depicts a bodhisattva, one destined for Buddhahood who postpones it to assist others in reaching enlightenment. The sculptor used Japanese cypress (hinoki) and employed the technique of joined-wood block construction (yosegi zukuri) in which multiple hollow blocks were joined in a single statue. Once assembled, the blocks were painted and gilded. These techniques allowed for a sense of movement in the figure that was not constrained by carving from a single block of wood. Jizō Bosatsu is portrayed as a monk with a shaved head, dressed in a simple robe. He holds a six-ring staff (shakujō) that he shakes to awaken us from our delusions and break us free from the six states of rebirth to achieve enlightenment. In his left hand he hold the wish-granting jewel (nyoi hōju). The standing sculpture seems almost ready to move, an active figure ready to assist the supplicant. In a ritual setting, the surrounding chanting by monks, beating of gongs and swirls of incense would have added to the sensation of movement of the sculpture. A form of Buddhism which attracted a large following during the Kamakura era was Pure Land Buddhism. Especially popular with the masses, Pure Land Buddhism taught that the chanting of the name of Amitabha Buddha with total concentration, faith and trust would guarantee a welcome to the Pure Land, a place which provided a stepping stone towards rebirth on a lotus in the Western Paradise. Amida Buddha (Sanskrit: Amitabha; the Buddha of the Western Paradise) was regarded as a sort of savior, welcoming the faithful to the Pure Land and breaking the cycle of reincarnation. 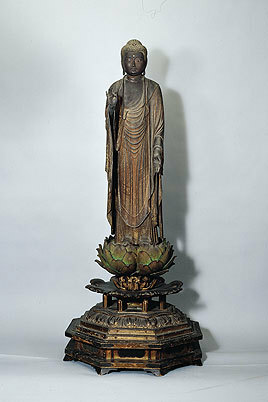 A Buddha Amitabha sculpture of Japanese cypress stands on a lavishly carved pedestal with a lotus. Fine gold lines (kirikane) are used to outline the complex ornamentation of the figure's garments. The right hand of the Buddha displays the hand gesture or mudra of raigõ or welcome. 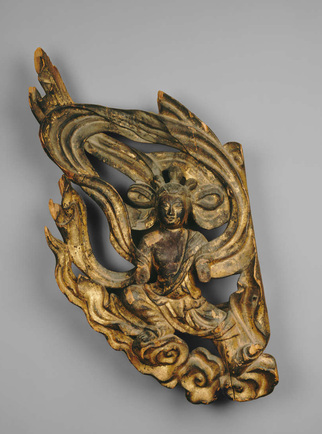 Amida displays this mudra when he descends to welcome the faithful into his Pure Land. A sculpture such as this might have been placed at the deathbed of a devotee, offering comfort and the reassurance of welcome in the Western Paradise. These miracle-working icons brought devotees into closer proximity with the deity, and artistic embellishments were added to enhance that relationship and the karmic bond between statue and worshipper. Inset crystal eyes were inserted into sockets from the hollow interior. Painted on the concave sides, the eyes glittered in the firelight of temples and deathbed bedrooms alike, adding life-like detail. Further, these statues were consecrated during an 'eye-opening ceremony,' (kaigen kuyō) including the symbolic painting of the pupils to render the icon spiritually potent. The hollow interiors of joined woodblock sculpture meant that there was room for deposits that resided within the icon. These items rendered the image more powerful and efficacious. A splendid Jizō Bosatsu by the sculptor Kōen (1207-after 1275) illustrates this practice. Sent for conservation by the curators of the Museum of East Asian Art, Cologne in the 1980s, the head of the statue was found to be loose. When removed from the body of the statue, it was revealed that a vast array of items had been placed in the statue's interior. These objects are on display in alongside the sculpture revealing the true power and dynamism of this work for the faithful. A silk brocade bag holds a relic of the Buddha, thought to endow the piece with magical properties and to sanctify the icon. Small bronze copies of miracle-working statues, thought to have the ability to render the image more powerful, were found inside the head of the sculpture. Thousands of printed versions of Amida Buddha and Jizō were inscribed with the names of individual donors. These brought merit to the donor and were also thought to establish a karmic bond between the donors and the icon. 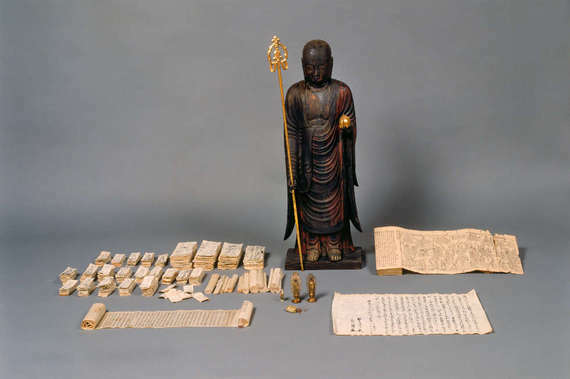 Scriptures in the form of scrolls and a printed accordion-fold book from China evoked the presence of the Buddha through his teachings. All these interior works combine with the exterior form of the statue and ritual context to endow this sculpture with spiritual power, dynamism and efficacy. Lasting less than 150 years, the Kamakura era was a golden age of Japanese Buddhist art. Responding to the political and social landscapes of the age, traditional and new practices competed and combined in innovative ways that resulted in masterpieces of outstanding realism and dynamism. The exhibition at the Asia Society presents masterpieces of the era along with masterful explanations to bring the art of the Kamakura era to life in a splendid exhibition. Kamakura: Realism and Spirituality in the Sculpture of Japan is on view at the Asia Society Museum from February 9 through May 8, 2016.